I was in a hurry earlier and maybe my post may have seemed a little short so now that I have time. The threaded hole is for a screw that must be removed to disassemble the wheel but that is only 1/2 the problem. when the steering wheel is locked (that gear on the back will not spin independently of the wheel this is the normal driving setting) then you remove the screw from the threaded hole and the wheel is turned ccw while the "horn ring" is turned cw WEAR GLOVES if there is any corrosion in the wheel this can be a tough twist and when it lets go you can scrape your knuckles (P.E.) Remember this was an anti theft device that was required by insurance companies in the day if you wanted or were required to insure your "T" because every one knew that if you had the dealer 5 keys you could drive away in any "T" I am assuming that your wheel is in the unlocked position because you cannot get it apart. When you unlock the wheel there is a lock pin that extends into the "horn ring" hub allowing the wheel to spin freely without turning the front wheels but not allow you to disassemble the wheel... If you live close to Jacksonville Fl bring it by I have the technology... again please excuse my previous post if it seemed terse G.R. 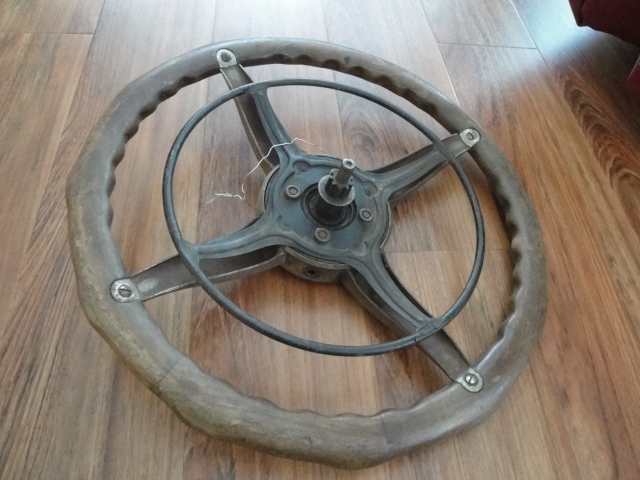 I had one of these steering wheels. I can't help with the taking it apart bit but I will suggest just setting it in place without the cover and see how you like it. When I installed mine it just felt too big for me (thin build small hands) and the car (21 huckster). The Seng's are great looking wheels and I like the horn ring. Two years ago I was going to a car show with my 26 roadster and the steering wheel broke. I had a Seng wheel in the shop and put it on to get me by. It's still on. I got a new rim from Bob B. and repaired the old wheel but was never able to get the Seng off. Al thanks for bringing this up and G.R. thanks for the reply. Hopefully I can find the original steering wheel in all my junk. That screw in the side only had threads for about 3/8 of an inch or so then the end that goes into the inner hub is just smooth so if the threads are clear unless they Jammed the end of the screw in there it should have fallen out That screw was only there to prevent the wheel from coming apart when driving since the lock pin prevents the wheel from coming apart when the wheel is unlocked. check your P.M.
No problem Have a Merry Christmas and a Healthy , Happy & Prosperous new year!